Looking for something cute with a bite to see in the afternoons of the Fringe weekends while recovering from the night before? This could be it! 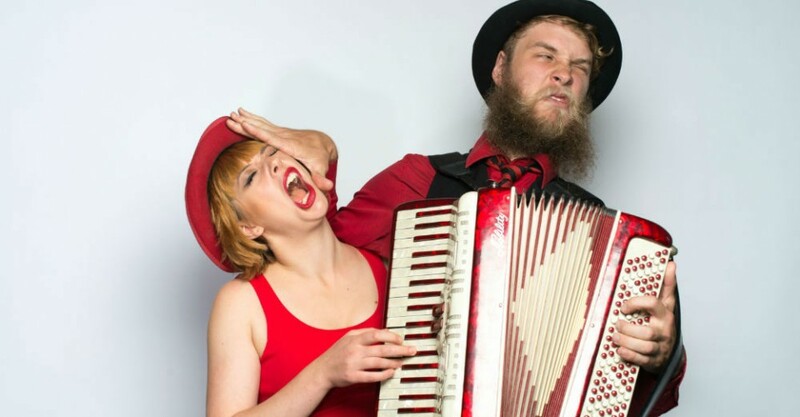 Strangely, one half of this duo and Claire Healy, the other half, have their own solo evening shows, but together they make the taking off of shoes, Gin-drinking, bell-ringing and playing ukulele seem fun. While they may never really replace David and Margaret, it would be great to see some of the movies they were describing. They both have fantastic smiles and seemed to really enjoy our company and their own so we couldn’t help but smile along with them. It was enjoyable to hear them go a little ‘off script’ meaning they were reacting to what was happening right there and then in front of them. This proves they are not only good performers but also good listeners. They are both obviously accomplished in front of a crowd and it was nice to be brought into their world rather than just watch it. Who knew that accordion playing could be cool? Or that singing a sea shanty could be that much fun? Or that the final mash-up song could be that good? They had us leaving with the belief that we just had to let it all go and never stop believing in ourselves. What a fantastic message to sing and hum all the way back to the car. Strangely Flamboyant continues at Royal Croquet Club’s The Rastelli until Sun Mar 8. Claire Healy and Strangely join forces for a cute fun cabaret! Tags: Adelaide Fringe 2015 At The Movies Cabaret Caitlin Mogridge Charissa McCluskey-Garcia Claire Healy David and Margaret Roaring Accordian Royal Croquet Club Strangely Strangely Flamboyant Tarntanyangga The Clothesline The Rastelli Victoria Square What Is Cabaret?